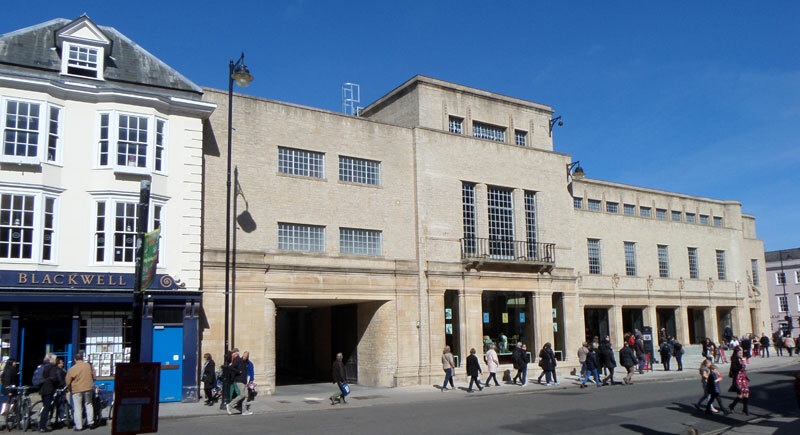 The £80m Weston Library was opened on the site of the New Bodleian Library on 21 March 2015. The façade of this building by Giles Gilbert Scott was retained. Despite the above comment, the New Bodleian Library became a Grade II listed building in October 2003 (List Entry No. 1390596). 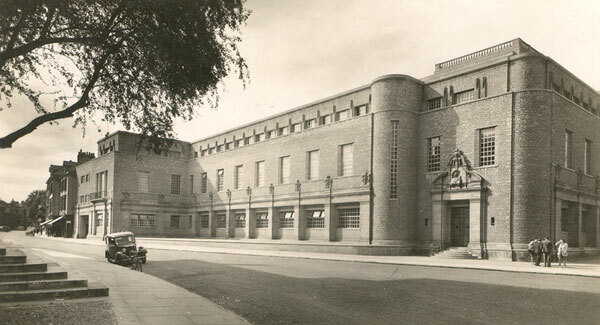 The report of a University Commission published in 1931 led to the building of the New Bodleian Library, designed by Sir Giles Gilbert Scott, at a cost of £1 million. It was opened in 1940 by George VI, when unfortunately the silver key broke in the lock. As well as reading rooms, the library had an eleven-floor book stack with space for 5 million volumes connected to the old Bodleian Library by an underground conveyor belt. A south-facing extension was built on the roof to the designs of Robert Potter in 1966–68 to accommodate the Indian Institute Library when the old Indian Institute was converted into offices. On the outside wall of the library is a row of cartouches containing the arms of the following, running from east to west: Sir Giles Gilbert Scott, Sir Edmund Craster, Lord Halifax, Viscount Grey, the City of Oxford, the Stationers’ Company, Cecil Rhodes, John Radcliffe, Duke Humfrey, Thomas de Cobham, William Laud, William Herbert, Sir Kenelm Digby, Richard Rawlinson, Francis Douce, the University of Oxford, John Selden, Thomas Tanner, Richard Gough, Lord Sunderlin, and Thomas, 2nd Earl Brassey. 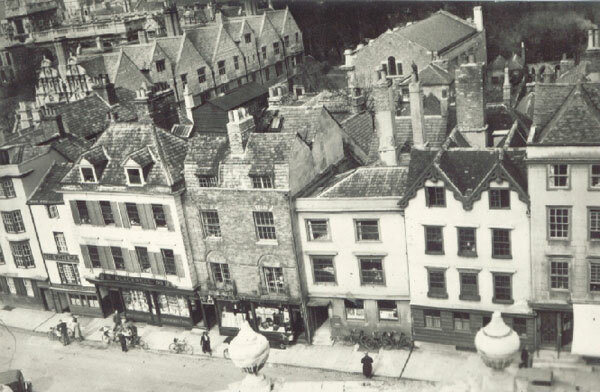 This photograph shows the first three houses on the right of the group: the Coach & Horses pub at No. 35 on the corner of Parks Road, then next to it on the left Nos. 36 and 37, with a fraction of No. 38 in the frame. Running right to left are Nos. 42, 43, and 44 (the third marked as antique furniture showrooms). Then comes No. 45 (a large house four windows wide), and Nos. 46 and 47. 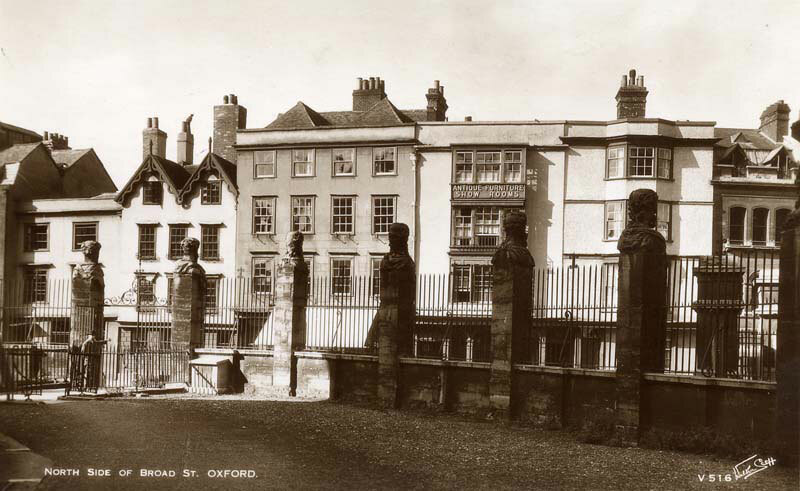 Photograph taken from the Sheldonian Theatre (reproduced with kind permission of Sue Chaundy), showing Nos. 45, 46, 47, 48 and 49 Broad Street, running from right to left. Then comes the pair of semi-detached houses at Nos. 50 & 51 that had to be rebuilt because their foundations were damaged in the demolition process, and are now the right-hand side of Blackwell's. Only then do the shops become familiar, with the present Nos. 50 and 51 that form the left-hand side of Blackwell’s, followed by the White Horse pub at No. 52 and No. 53 on the far left. I received notice from the University who owned the property that at any moment the house might be pulled down with all those from the corner of Parks Road to Blackwell’s bookshop to make room for the new Bodleian Library. This was no surprise to me as for several years various schemes for the site of the new Bodleian had been the subject of hot discussion in the University and the public press. Once the Broad Street site was definitely turned down by Convocation, and to celebrate the good news we hung a flag from the windows of “Thirty-seven”; but when a commission reported that Broad Street was their choice we knew that our days there were numbered.